Ok, so you have to excuse the bad picture but, I picked up this small walnut side table at a resale shop a few weeks ago for a mere $30. I sort of fell in love with it for no real reason. It's small but it has a magazine rack on the bottom and a cute little cabinet on top. Right now it is in the little reading corner I have in our frontroom but, eventually I want to have it next to the piano (which we have not yet moved from my in-laws house) so I can store music books on the bottom and my metronome and pitch pipes in the cabinet (I studied voice for about 8 years). I wouldn't say it is in the BEST shape but, I managed to clean it up a bit and fix a few scratches. It's just one of those things I saw and had to buy! Very cute! It sounds perfect for your music items. 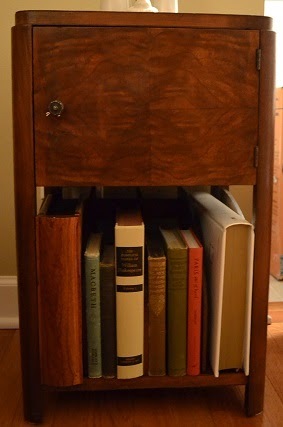 My mother had a small cabinet similar to yours that was lined in copper and designed to store tobacco. Dana, you are actually the second person to tell me that. It isn't lined with copper but it does have the date May 19th, 1945 on the bottom.